Happy 4th July – you ready to party! 4th of July is here & we’re ready to rock the Shoppingtown Hotel tonight!! 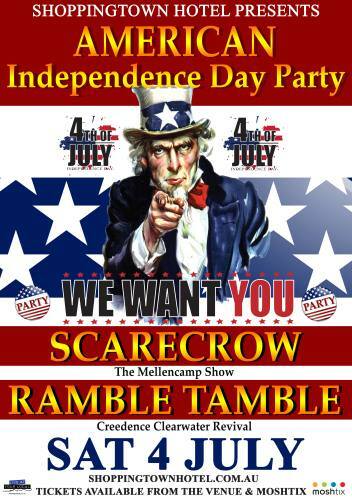 Scarecrow – The Mellencamp Show & Ramble Tamble – The Creedence Clearwater Revival Tribute will play back to back sets. You’ll hear the “Hits” from both John Mellencamp & Creedence as each rocking band pays tribute to these amazing American legends on this stars and stripes night. So round up your favourite people and book your tickets now! You don’t want to miss this – see you there!